The sleuths from the investigation wing of the Income Tax department today swooped down on several business houses dealing in petrol, cooking gas (LPG), LPG bottling and cycle parts in a bid to unearth concealed income. Various social and educational organisations of the area have appreciated the role of the Sangrur district police in building up the confidence of girl students and women by inspiring police personnel to get rakhis tied from them. Immediately after arrival of a team of professional divers from the Bhakhra Beas Management Board, the authorities announced to have retrieved the bodies of four children drowned in the Bathinda Feeder Canal when a truck carrying 46 devotees fell into the canal, near here, on Tuesday. The coordination committee of para-medical and health employees, Punjab, has threatened to hold a state-level protest demonstration and gherao at the Directorate of Health in Chandigarh on August 18 if pending demands of employees were not accepted and implemented without any delay. The Marxist Communist Party of India (United) has condemned the bombing on Lebanon and targeting of the civilian population by Israeli forces, supported by the US. Chief Minister Amarinder Singh today reiterated his commitment to turn Punjab as one of the major commercial centres of the country with world-class infrastructure. He was addressing a gathering after laying the foundation stone of a private township project near here. The township is being executed at the cost of Rs 400 crore in around 200 acres of land. The state government has allocated Rs 1154 crore for different schemes under a composite plan for the welfare of Scheduled Castes and other economically weaker sections during the current financial year. During last year, a sum of Rs 934 crore was spent for this purpose. Local industrialists today alleged that the government rules on power theft were “draconian” in nature. At a press conference by the Punjab Pradesh Beopar Mandal and Apex Chamber of Commerce and Industry, representatives of industry said the latest provisions on electricity theft pertaining to penalties would have an adverse impact on all sections of consumers. Former president of the Delhi Sikh Gurdwara Managing Committee and president of the Akali Dal, Delhi, Mr Paramjit Singh Sarna, today suggested an independent probe into allegations levelled against him by the Shriomani Akali Dal-Badal group on the missing gold from the Golden palki. Two students of KVM’s Eco-Club accompanied by their in charge, Ms Jeevan Kaur and Ms Anuradha Kaushal planted saplings at Kitchlu Nagar, G-Block Park. Mr B.K. 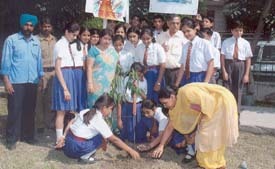 Gupta, Joint Commissioner, municipal corporation, here also assisted in the venture “earth matters programme”. Ludhiana, August 10 The Punjab Agricultural University Employees Union today staged a dharna on the campus against the local Audit Department of the Punjab Government in protest against the “undue objections” raised by the department, which had resulted in rejection of decisions of the Board of Management and other competent authorities of the PAU. Member of the Guru Kirpa Seva Mission Charitable Trust yesterday celebrated Rakhi in a unique way. Children tied rakhis to trees to draw the attention of the people towards the degrading environment. MH One TV Network kicked off audition for its music talent hunt show “Awaaz Punjab Di” in the city today. “Last year, the show received quite an encouraging response. This time, in the auditions conducted in Amritsar and Chandigarh, we have already received more than 40,000 entries and expect three to four times higher participation than last year,” said CEO Pradeep Gangal. Young artistes these days seem to be in a hurry to make their presence felt. It could be their search for glamour or lack of patience needed to hone their art. Mr Kishor Namit Kapoor, the person responsible for training stalwart like Saif Ali Khan, Vivek Oberoi, Hrithik Roshan, Kareena Kapoor etc, feels that acting was a thorough research. One had to put in best efforts to get perfect results. Mr Kapoor is in the city for two days to take the auditions of budding actors. Auditions for SaharaOne’s reality show “Fair and Lovely Menz Active Super Stars” were held here today. The show provides platform to budding actors to showcase their talent. Another ‘talent show’ to shortlist two students for Rin Mera Star Super Star in a nation wide contest organised by Rin Advance was held at DAV Public School, BRS Nagar, Ludhiana today. Olympian Ramandeep Singh, model Ashu and Punjabi folk singer Malhar, were present at the function. The presence of the Olympian Ramandeep Singh electrified the participants. Each vied with another to be selected. Prof Manjit Kaur Patiala enthralled audience with her melodious voice at a musical evening at Punjabi Bhavan here yesterday. 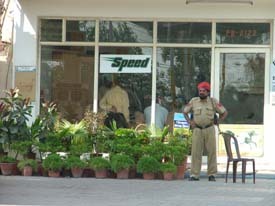 The Punjabi Sahitya Akademi, Ludhiana, had organised the show. In the ongoing Punjab Schools Zonal Sports (PAU zone), Sanatan Vidya Mandir Senior Secondary School, Civil Lines, besides Satluj Public School, GGN School, Rose Garden, and Green Land Senior Secondary School won their respective quarterfinal badminton matches to enter the semifinals in the different age groups today.